The publication of the Department of Health White Paper "The Health of the Nation" (1992) and "Our Healthier Nation" (1998) gave emphasis to the importance of nutritional health of the nation at all ages. It is clear that the achievement of specific targets for pregnancy and infancy as set out in the White Paper will involve the training of all health care professionals in nutrition education. This book responds to the challenge and focuses on good nutrition for and during pregnancy, in low birth-weight infants, and during infancy. It has a strong public health emphasis, dealing with health prevention issues for the Nation's younger population. The text is written as a scientific reference book for those seeking to apply science in the support of a successful pregnancy and in the prevention of nutritional problems during foetal and early post-natal life. The importance of optimal nutrition during these periods of life is emphasised by the overwhelming evidence that nutritional problems in early embryonic life may cause congenital malformations and during late foetal life and early post natal life may set the molecular programme for later disease development. About Jane Morgan (Author) : Jane Morgan is a published author. Published credits of Jane Morgan include Child Victims: Crime, Impact, and Criminal Justice. About Jane B. Morgan (Editor) : Jane B. Morgan is a published editor. 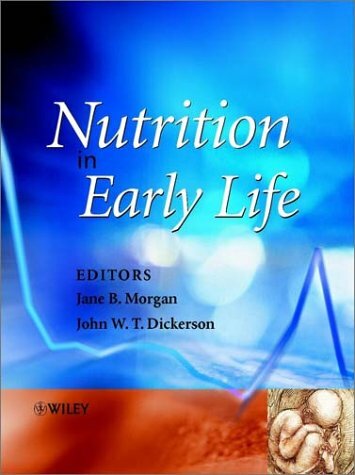 Published credits of Jane B. Morgan include Nutrition in Early Life. About John W. T. Dickerson (Editor) : John W. T. Dickerson is a published editor. Published credits of John W. T. Dickerson include Nutrition in Early Life.